Switchblades come in different shapes and sizes, but most fall into one of two categories. With an out-the-front, or OTF, switchblade, the blade pops out of the handle automatically when a lever is pushed or pulled or a button is depressed. 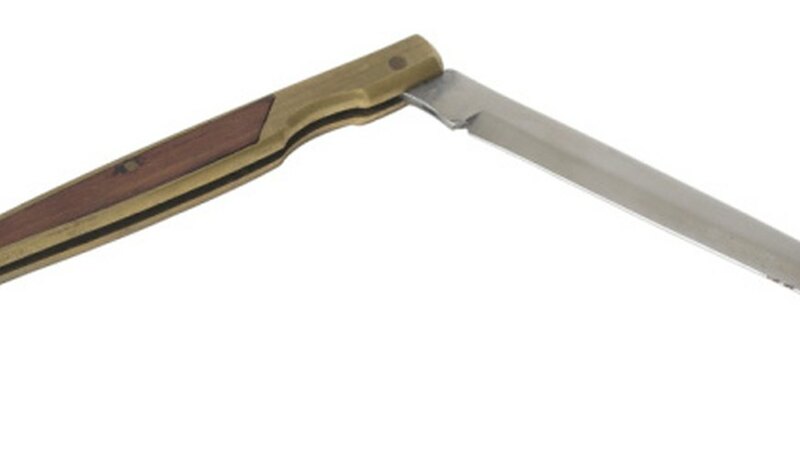 A side out switchblade requires the user to manually open the blade part of the way until a spring mechanism takes over to open it fully and lock it in place. With both categories of switchblade, the method of sheathing the blade is the same. Push or pull the button or lever that controls the locking mechanism. Carefully locate the dull side of the blade. Push the dull side so the knife folds inward toward the handle. Push or pull the button or lever to return the knife to a locked position when the blade is sheathed. Check your state laws and regulations before acquiring a switchblade. Dan Komienski began writing profesionally in 2004. He has written for thecircumference.org and online games such as "Rock Mars" for Werocreative. Komienski's playwriting has appeared in Toronto's Fringe and Summerworks theater festivals. His experience in the real estate, travel and gaming industries informs his non-fiction writing. Komienski received a Bachelor of Fine Arts in creative writing from the University of British Columbia.